Hi! This blog is a set of conversations on subjects related to CAD and fabrication, especially the technology available to consumers and makers. Please feel free to comment on the post and others' comments! 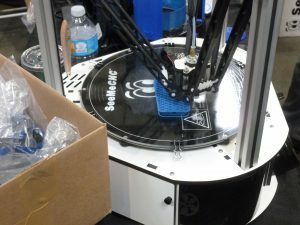 This post briefly highlights what I thought were the most interesting products and events related to 3D printing at the May 2016 Bay Area Maker Faire. The faire had its usual wide variety of projects, products, and services from various vendors and exhibitors. As is usual at maker faires, majority of attractions had to do with arts and crafts projects. 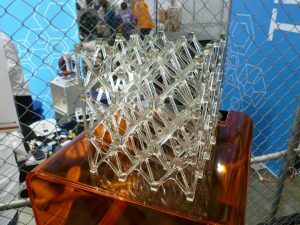 However, there were several booths that sophisticated tools that makers would use to make stuff, most notably 3D printers, routers, and laser cutters. Below are a few of these that caught my attention. Formlabs: Formlabs was showing off their new Forms2 machine, which they bill as “The most advanced desktop 3D printer ever created”, and I believe it. The printing process is stereolithography, an amazing technology in which lasers are used to “photopoymerize” layers of resin to create the desired object. The picture at right shows a demo 3D lattice. At $3,500 just for the hardware, it’s not destined to be on the desktop of every maker, but schools and pro-makers, its just the ticket for creating working prototypes and one-offs (or “few-offs”). 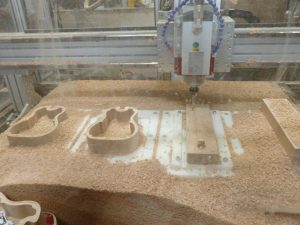 CNC Router Parts: Meanwhile, the machines over at the CNC Router Parts booth were cranking out functional ukulele’s: Body and neck in wood, and metal sound board. (There was a Ukulele raffle every hour or so.) This company specializes in selling router machine kits, including standard and proprietary components, which customers then assemble themselves. Three lines of equipment are available, “Standard”, “Pro”, and the lower-end “Benchtop”. I personally like the assemble-it-yourself “kit” concept. Not only are kits far less expensive than pre-assembled solutions, but the assembly process gives users a more complete understanding of the mechanics of the equipment. (Besides, what maker wouldn’t want to build their own equipment?!) This company will certainly be on my short list of router vendors when I become in the market for a machine. The kits range in price from $2,195 for the Benchtop Standard CNC Machine Kit, to $6,125 for the giant PRO60120 5′ x 10′ CNC Router Kit. See Me CNC: The See Me CNC products are among a few filament-based 3D printers on the market that use a “delta” rig. Essentially the print head is attached to the base of 3 guide arms. The print head moves laterally when the top of each arm is moved vertically with respect to the other rods during the printing of a particular layer. All arms move up the same amount (or, the platform is lowered) to advance the print head to the next layer. Like the CNC Router Parts machines, the See Me CNC devices come in kit form, but for extra $s can be bought pre-assembled. They were highlighting their Rostock MAX V2 model, selling for $999 (kit) and $1,899 (pre-assembled). 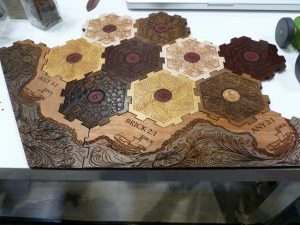 Glowforge: There was a lot interest in laser cutting products, most notably for the yet-to-ship Glowforge printers. It was standing room only in the Glowforge booth. They had an impressive display of sample cut and etched items created by their Basic- and slightly more powerful Pro machines. The hexagon puzzle at right was one of the most impressive creations. It’s clear that Glowforge is also putting a lot of effort into their software to make printing a snap for any user. For example, users can design, position, and send their drawings to the printer. My own thoughts are that the Glowforge products would be of primary interest to artistic types as opposed engineers whose requirements often demand a larger printing “canvas”, and need to cut through thicker or tougher materials than the present Glowforge models could manage. (This isn’t to discount the Glowforge as a business investment: There’s a burgeoning industry artisans selling craft made by laser cutters.) Do take a look at the well done Glowforge Website and related videos on YouTube. As of this post, pre-order pricing is $2,395 for the Basic model, and $4,795 for the Pro version. I’d be interested to know readers thoughts on these products, especially if you have first-hand experience. Meanwhile, in the OMG department, take a look at this youtube video showing the “printing” of a play castle out of concrete. See a related news clip here. Macro printing is definitely worth a future post. For this inaugural post, I’d like to first thank you all for visiting this blog and Web site. I hope you find it useful over time, and I encourage (even ask) you to contribute to blog conversations. My intention is for this blog to host discussions on a range of topics on CAD and 3D printing, with a special emphasis on the design and prototyping of “utilitarian” things, and less so on “arts and craft” things. Conversations might also touch on the productization and marketing of our inventions, though admittedly these topics are worthy of their own blogs (and even sub-blogs). In addition, I’ll be adding pages for reference materials, product ideas, tutorials, and so forth. A final personal note: Part of the purpose of this blog and Web site is to get myself educated in these CAD and 3D printing subjects. I’m a semi-retired technical writer, whose gigs primarily include software companies. So if you are anything more than a beginner in this field, please bear with my frequent coverage of the basics. Hi all. See you at the Maker Faire this weekend. Subscribe to this blog to be notified of new posts by email! Note: Some of the links contained within this site have my referral ID (e.g., Amazon), which provides me with a small commission for each sale. Thank you for your support. Click the RSVP link below to sign up to attend the Aug 28, 2016 meeting of the Silicon Valley Fusion 360 Meetup group.